Happy Monday! 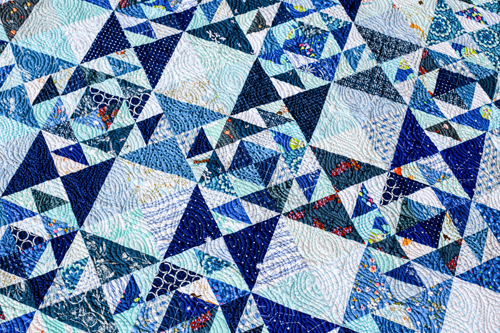 I'm really excited to share one of my recent quilting finishes with you today! Earlier this year I was approached by Pat Roche, owner of Triangles on a Roll, asking if I'd be interested in trying out her products. Christina has been using and talking about triangles on a roll for years, and I had always wanted to try them. I had been thinking about what quilt I wanted to remake from Patchwork Essentials: The Half-Square Triangle, so Pat's email was perfect timing! Woven Quilt from Relative Scale Chapter. © 2015 Lauren Hunt for Lucky Spool Media. I decided I would make the Woven quilt. This is one of my favorite designs in the book, and both half-square triangle sizes matched up with roll sizes. You can get half-square triangle rolls in eleven different sizes. 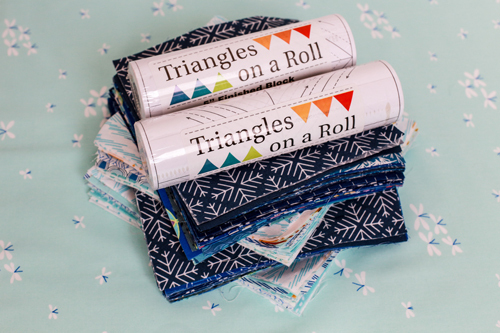 Use the half-square triangle finished sizes provided with each quilt in the book to decide which size rolls you need! They also make rolls for quarter-square triangles, flying geese, braids, and other triangles! Find them all here. 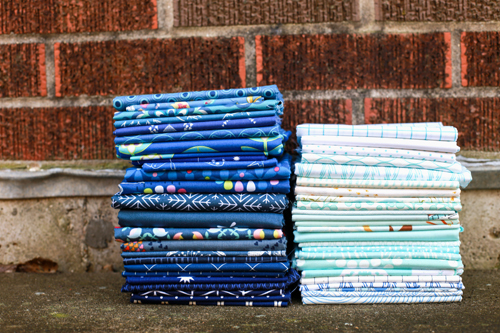 I recently reorganized all my quilting cotton fabrics and realized I have a very large stash of blues. In an effort to make a dent in my blue stash, I decided to make an all blue Woven quilt. I didn't have enough of any one fabric for the background, so I used low-volume light blues for the background, and navy blues for the "print" portion. I needed one roll of each size to make my half-square triangles for this quilt. That kept things nice and simple. 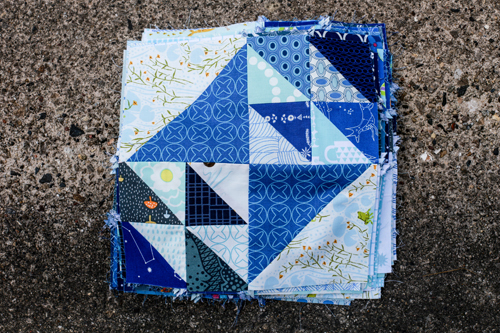 I wanted this quilt to be super scrappy, so I cut squares from my stacks, but it would have been a lot more efficient to cut strips (which is what the instructions say to do!). Next time I use the rolls I'll do that! So how do you use Triangles on a Roll? 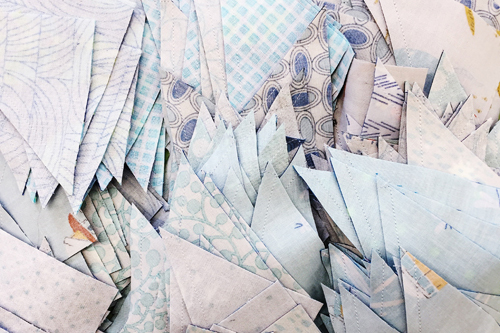 They're basically rolls of foundation paper that you sew through and then trim down to size to make your half-square triangles. I pinned the paper to each pair of squares, then sewed on the marked lines through the paper. After that I cut around the outside lines as indicated. Finally I pulled off the papers and pressed. The half-square triangles are now the perfect size and ready to go. 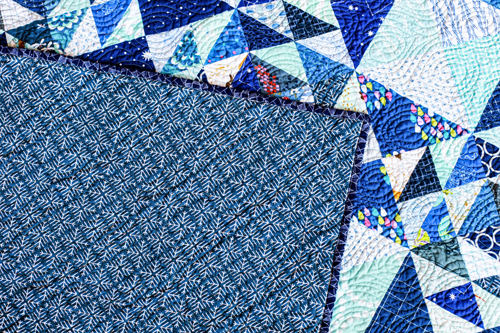 After making lots and lots of half-square triangles for the quilts in my book, it was fun trying out a completely different piecing method. I enjoyed mixing it up, and I would definitely use the rolls again! I have some left of both sizes so I'll be able to make something else too. 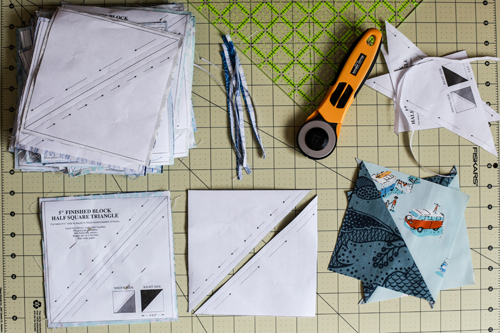 Check out some of my other favorite half-square triangle and quilting tools here. I tried really hard to have no two same prints touching each other when I pieced all the blocks together and I *think* I succeeded! It required a little block surgery since I found a couple when the top was already mostly pieced, but it was worth it. Ta-da! When I first started this quilt I was unsure that I would have enough contrast throughout the quilt to really let the pattern shine. I almost ditched some of the more muted dark blues and the darker light blues. Thankfully, Jacey talked me out of it! I am so happy with the range of colors and pattern. 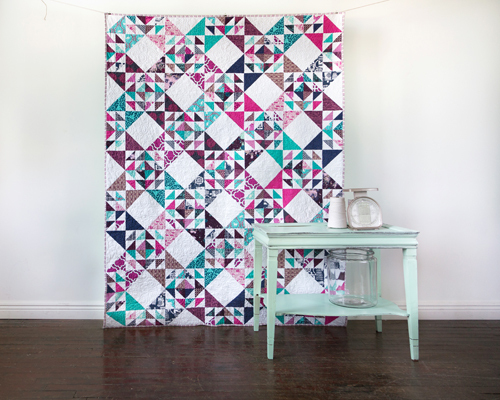 I sent this quilt and my Blockade Quilt to Melissa of Sew Shabby Quilting for quilting. I love this Peacock Feathers pattern she had, this was my first time choosing it. I think it adds nice movement to the geometric design. I pieced together a backing from navy yardage I had on hand, and bound it up in the same Luxe in Bloom print that I used for Amanda's quilt. Melissa finished quilting my quilts right before I left for Ohio last month, so I asked her to ship them to my parent's house. 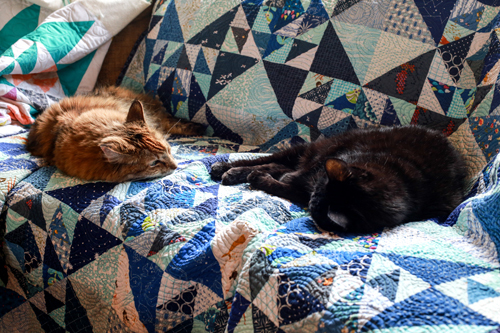 I was able to bind and photograph both quilts while I was home. There was no shortage of helpers and testers around! I know the last quilt I finished is usually my favorite, but I really love this one. This is my first monochromatic quilt and I think I'd like to make more. I wish it had eaten up more of my blue stash, but I did use up a total of 11.5 yards making this quilt! I used so many different fabrics, including some precious hoarded ones. 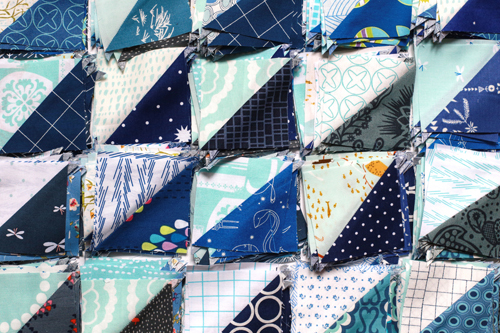 It's fun to see many years of fabrics mixing together in one quilt. Yay for stash diving! Pick up a copy of Patchwork Essentials here. Beautiful quilt! The scrappiness was perfect adding interest while still allowing the design to shine. This is really gorgeous. I remember seeing snippets on IG and thinking it would be fabulous. Seeing it in full it's even better, and you really made the scrappiness sing. What a great quilt! Love the scrappiness and the design. That is wonderful. Love the quilting! All of the blues are just beautiful! 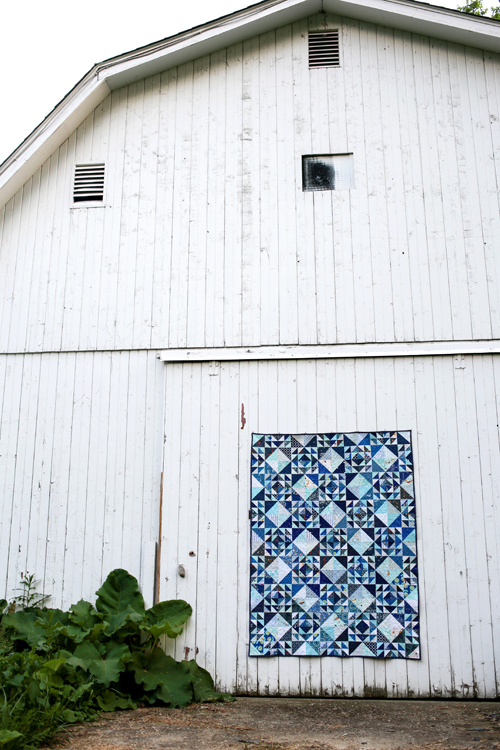 Such a great scrappy quilt and lovey on the barn! Wow, beautiful! Love the quilt! 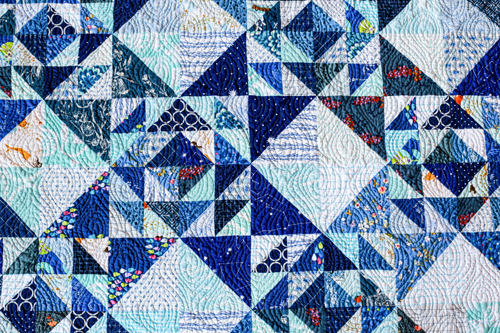 Your blue quilt is stunning! Love the backing fabric, too. Do you happen to know what it is? Perhaps from the selvage? I *heart* them! I immediately thought of you when I first used them. I think it saves our hands from a lot of pain that comes with squaring all those HSTs. Beautiful quilt - I love the colors! It's completely amazing! Really. All blues plus scrappy plus cat testers!! Hooray! 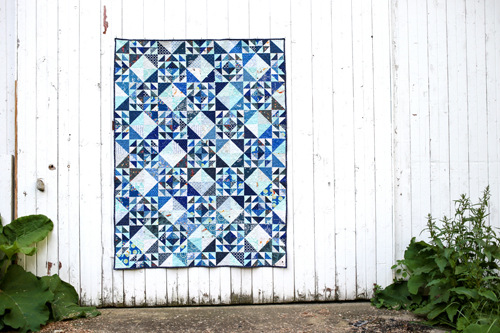 Love your beautiful scrappy quilt, perfect quilting pattern, really adds texture!! !